When it comes to beautiful stained glass, we believe that everyone should have the opportunity to have it. Whether you’d like to install stained glass features in your Salt Lake City home, church, or business, finding high-quality, custom stained glass can really deliver you the right investment while simultaneously delivering many other benefits. Salt Lake City Stained Glass really works hard with each and every client to ensure we meet their budget constraints without compromising on quality. Regardless of your budget, we work hard to find a compromising project that delivers in aesthetics, performance, and quality. Stained glass has so many benefits often times making it a great ROI. 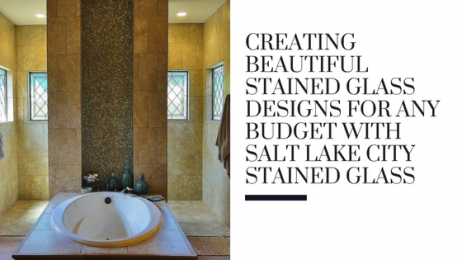 From effective privacy solutions to improving curb appeal, property value, inspiring congregations, attracting new customers, retaining repeat guests, increasing brand visibility, and much more, stained glass can really transform your existing Salt Lake City space. We begin every custom project with an on-site consultation free-of-charge to understand your goals and budget restrictions. We provide accurate project estimates and can always compromise designs to make sure it fits within your budget. We custom create every piece so there’s no middle man or additional manufacturer fee. Our team of local stained glass artisans begin the design process by sitting down with you to discuss design ideas. We’re happy to showcase our portfolio if you need any inspiration. We can bring any of your design ideas to fruition through the hand sketching process. We run all hand sketches through advanced design software to promote perfect proportions and coloring.